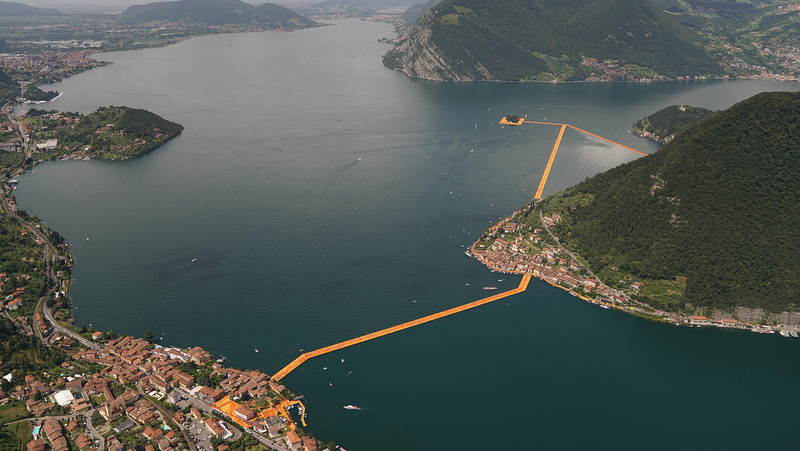 Over the weekend, my social media feeds were draped in neon orange as the world exuberantly shared the first photos of Christo’s latest work, The Floating Piers, a 1.8-mile walkway across an Italian lake. It's easily the artist’s most ambitious piece from an engineering perspective—and one that actually adds value to its location. 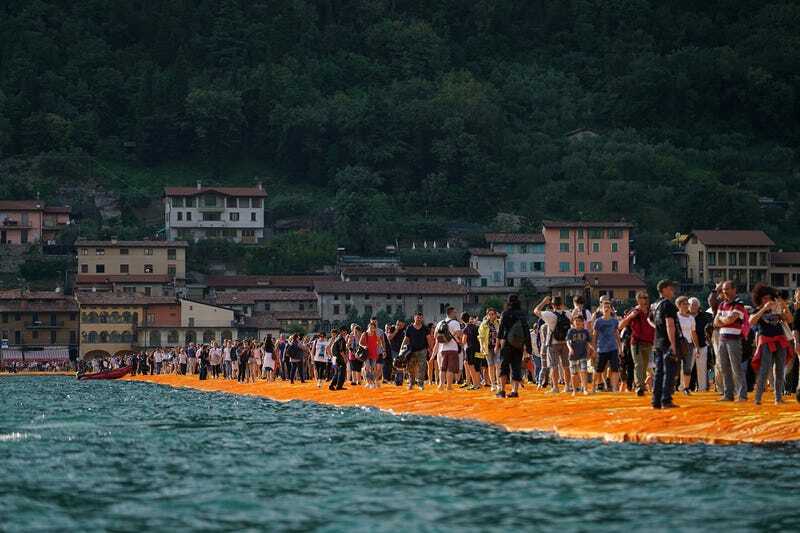 For a little over two weeks, visitors will be able to walk from the town of Sulzano to two tiny islands using a temporary pier made from 200,000 cubes of high-density polyethylene. The 53-foot-wide fabric-covered path is tethered to the lake bed but has no guardrail—it’s just your feet, the water, and a gently undulating quilted sidewalk. Christo—who is perhaps best known for the fancy drapes he installed in Central Park, in the same shade of orange—has executed dozens and dozens of similar projects which, until recently, were collaborations with his wife and partner Jeanne-Claude, who died in 2009. 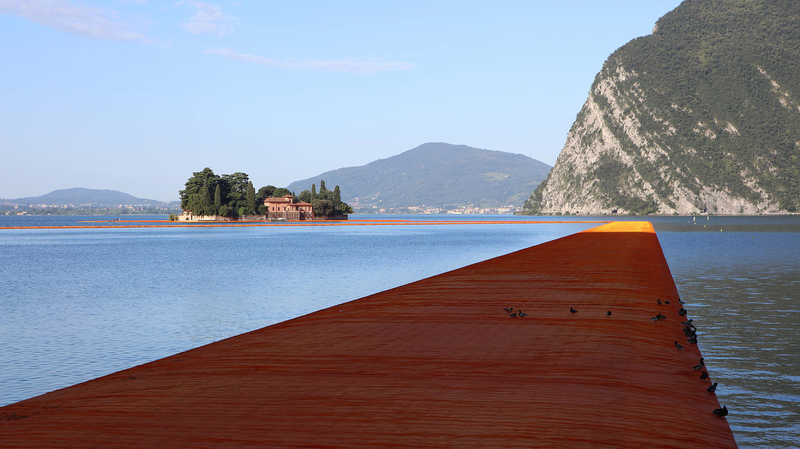 The Floating Piers is something different, though. This is not just a frilly skirt wrapped around an island which you might only admire from your private jet. This represents a major advancement in pedestrian infrastructure, and one that could very easily be adopted for our cities in a climate-changing world. This art is incredibly useful. Imagine the potential of deploying this type of temporary bridge after a disaster. A pathway like this would allow a city isolated by the destruction of a bridge due to a major storm or seismic activity to be reconnected to the mainland. And it’s not just a poetic solution for post-disaster. Innovations in floating walkways have general importance to highly populated coastal areas as sea levels rise. Another thing to note about The Floating Piers is that the pathways don’t end at the water’s edge. 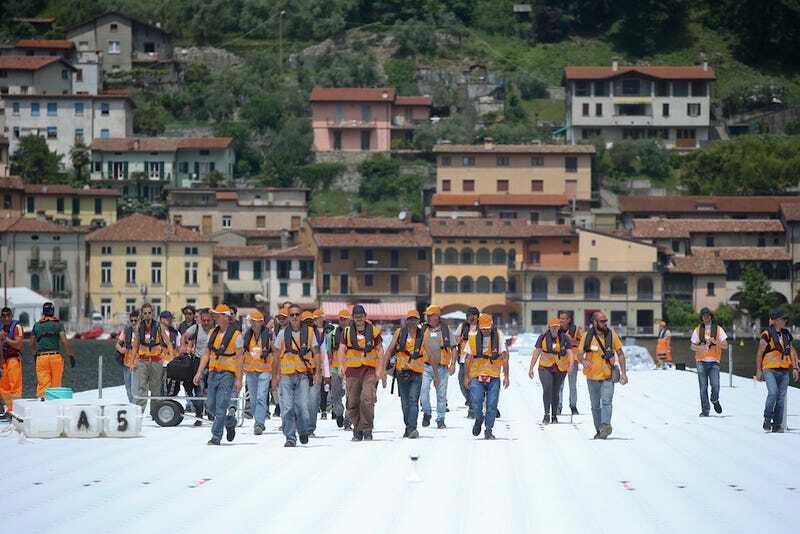 Instead, the orange carpet rolls through onto local streets, creating a wayfinding system that leads walkers up into the town. This could be a model for the way coastal cities integrate emergency routes for tsunamis and storm surges—and what better than this shade of traffic-cone orange to guide them? 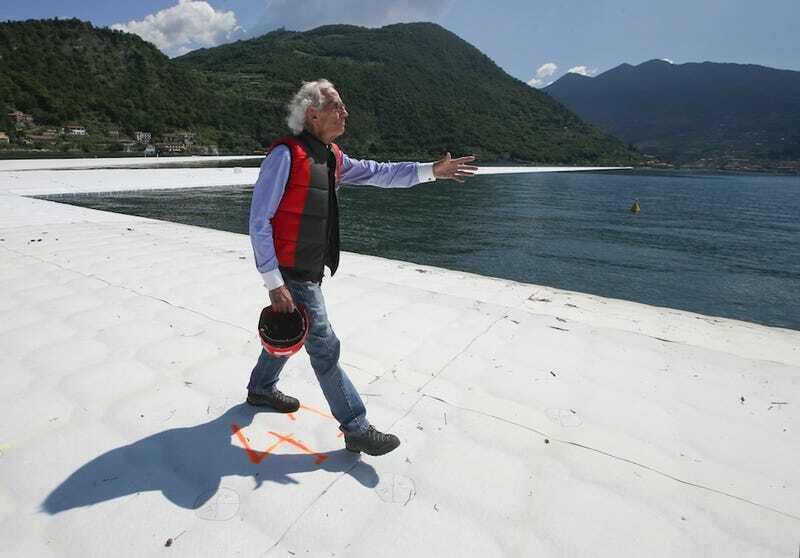 Of course, one might worry about the environmental impact that the installation itself caused to Lake Iseo—and yes, there were concerns—but Christo’s engineering team has managed to execute this project with the blessing of local scientists, using a light footprint, in a relatively quick two-year timeframe. Right now the biggest problem is that so many people are coming to see the walkway, the town is almost unable to accommodate so many visitors. But the piers are holding up just fine.